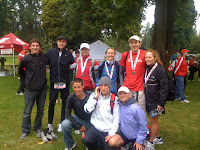 Before The day of this race even arrived I was plagued with what I thought were allergies. After two days of sneezing, It turned to coughing. Four mornings before the race I woke up with yellow flem in my lungs and feeling right crusty. On this same morning, I noticed a pain in my LCL (Lateral Collateral Ligament) just under my knee to the inside front of my right leg. I could feel a sharp pain there while climbing the stairs and lifting my leg quickly to a 90 degree position. "Oh, no!" I thought. It's one thing to be sick, it's another to be injured. You can run through a sickness, but try running through an injury and you're bound to wind up on the injured list. The reason I have come to for my body's rapid deterioration is that I was not taking proper care of my body while enduring such rigorous training. I enjoy the partying and being out on the beach with my friends. This more often than not involves a few wobbly pops and hours soaking in the sun. Add in a weakened immune system from lack of fruits and vegetables and rigorous training and you've got yourself a guaranteed recipe for disaster! I have spent the last few days eating green smoothies and super foods to boost my immune system and replenish all of the essential vitamins and minerals that my body demands so much of. Also have been taking drops of oregano oil down my throat to combat this virus. It's important for every serious athlete to consider the demands they put on their body every day and to accommodate that by providing one's self with the proper ratio of carbs, fatty oils and protein. As well as maintaining the proper level of hydration and electrolytes. Hydration is key, but if you are sweating a lot in your training, you should consider adding some electrolytes to your drinks to keep your sodium and blood sugar levels safe. Especially if the weather is warm. To make sure I did not waist the months of training I have put into this event, I have also dedicated myself to extreme relaxation and time off my legs. I reluctantly (but thankfully) played a Saturday evening game of pitch and putt to loosen myself out before the big day. Race morning has arrived and I wake up feeling calm and ready. The weather is cool and overcast with no sign of rain for the race. It's an early start so I must get my smoothie in me before 6am which is not easy for me. However, I enjoyed my liquid breakfast and was able to keep it and my oil of oregano down pre-race. I have finally got a hold on my pre-race anxiety!!! What a speed bump that was. I have learned so much about the mental part of my racing this season and am so excited to be out on course again. There is a mild traffic cluster but I found a spot in good time to get my bag checked. 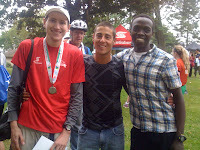 It is so exciting warming up with the likes of some of Canada's best runners. My knee feels fine through my warm up and the traffic enabled me to miss the pre-race down pour. Today I will race a solid race! I know this as I stand next to my competitors and teammates and shake each others hands and get ready for the starting gun. I find Mark Sherman on the line and know I will have a solid start if I stick with him. Off we go!! After the first loop we cross the start line again and my splits are all perfect going past 4k. At this point I am extremely happy. All of the fears I have been having over the last few days about my health and leg are gone and I know now for sure that I will be able to finish the race. (And at this speed, in record time) We head down the hill for the second time toward SW Marine and Mark has pulled slightly away. My splits are still on and I feel comfortable at this pace, so I let our string snap. I know that Drew and one more fellow were behind me working together to close the gap on me through this windy false flat section through campus past to wreck beach. I can hear their footsteps behind me and increase my pace slightly. As they close the gap on me, I am right in Marks draft now as he runs through the wetness and kicks up water all over me. The man chasing us has now left my draft and is pushing through for the pass. I feel like I can go with him and I do, fearing that Drew is following too. As we pull away, I realise it is just the two of us and I know that if i can just hang on to this guy, my relaxed draft through campus will be my reward and I will be able to fend off Drew and Mark. His pace is about a second or two faster than mine per km and I can feel myself starting to fatigue for the first time in the race. We are now cruising through the tall cedars around 8km still on par for my splits when I decide to listen to my body and let him go. I appreciate the 2.5km draft and now prepare myself for the difficult but smooth descent. My cadence increases with the grade and I try to refrain from pounding the pavement. I am relaxed but extremely focused on my running form down this massive hill. Too much speed can wear me out for the long false flats to come. The next few kilometers are comfortable with a couple of strong hill efforts and at least two very difficult recoveries. As I reach Cornwall and descend into Kits Beach, I feel the lack of substance in my racing flats as my calf muscles ache. Once again I focus on my breathing and form and keep my pace as I prepare for the punch in the soul before the finish. It's as if the creator of this course wanted to test every one's mental and physical valour by throwing Burrard street bridge at us in the last couple of kms. I have been waiting for this moment since last year, and have since run countless times over that monster and it was still as nasty and ugly as ever on race day. I swing my arms and push hard up this seemingly endless bridge as it feels like someone is pouring sand into my gears. I see and hear familiar faces atop the bridge which enables me the power to push over the top. My legs burn and my body aches, but I know not to relax as the up turns to down. I return my cadence to normal and lean into the downhill towards downtown. The end is so near and I embrace it. By the end of the bridge I have recovered and I am feeling really good and strong now. I increase my tempo and stride strongly along pacific. Coming into English Bay, the cheers grow louder and more frequent. I have done it!! I put a smile on my face an speak my positive affirmation in my mind. "I love Running!". Passing through the 21K mark and I can hear Stephen King announce my name as I put all of my heart and soul into the last 100m. Goddamn it feels good to be done!!!! Speaking of gramps, One of our teammates Kevin O'Connor won the Masters in a time of 1:10:17 good enough for 10th overall and currently holds the Canadian masters record for half marathon!! Outstanding! Am ever lucky to have this guy to train with. 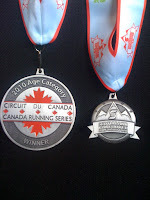 For the last two years, I have been working on becoming a great runner. It has been my dream to become pro and be sponsored by a shoe company. This dream is now becoming a reality. There are a few things one must do before they can be considered for a sponsorship. First, You have to race, Second, you have to be fast. 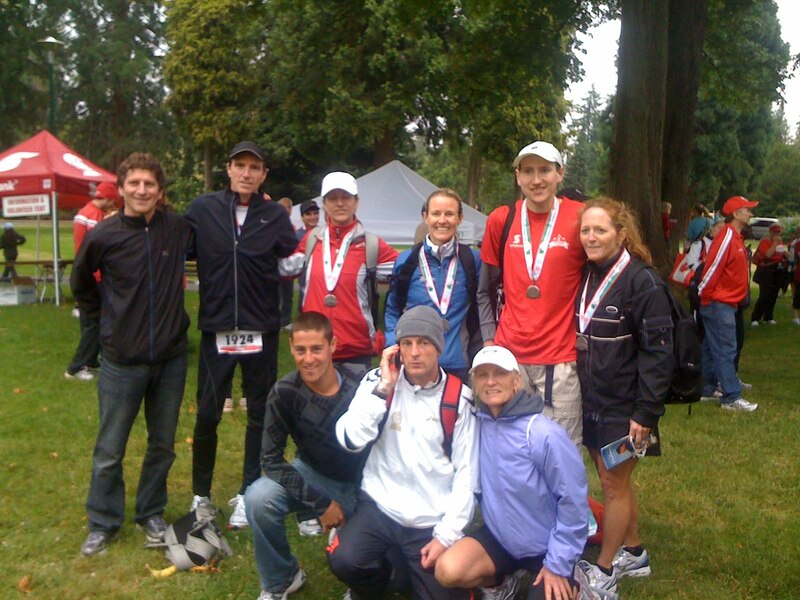 And third, you have to maintain a posative involvement with the running community. 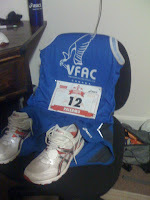 This year I volunteered to be Vice President of VFAC and have also worked tirelessly to make a name for myself in the Vancouver running community. 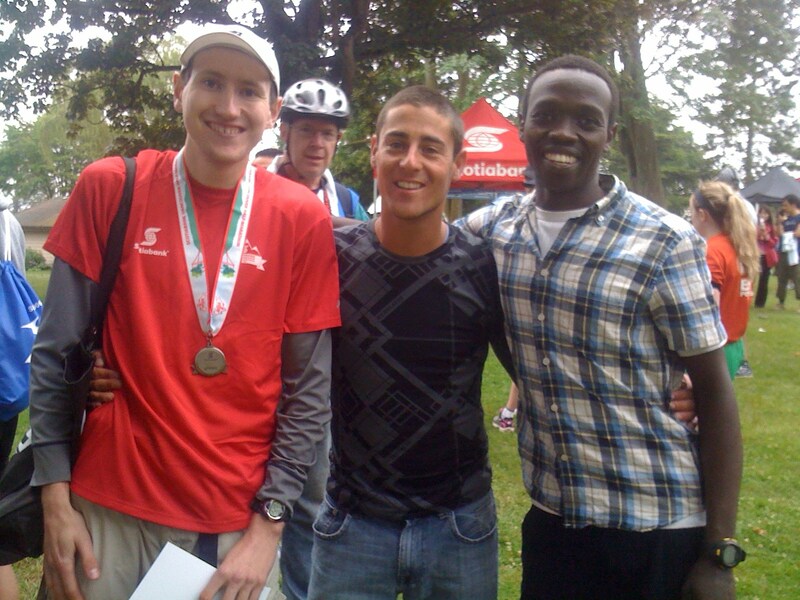 I enjoy volunteering at different races and creating a buzz and good vibe amongst all whom I meet at these events. Lately I have been checking out different companies and their athletes to see who has the best product and who treats their athletes the best. After much trial and tribulation, I have come to the board with two companies. The first choice (and this is not to jinx my chances, but just to send out good energy) would be Asics. (second Mizuno) The rep for this area seems to be very nice and said they might have room for me next year through forerunners on fourth. I am excited and look forward to reaching that level and representing my brand to the best of my ability. I hope to become a role model for other runners just like so many around me have for me and further ensure the enjoyment of this sport. Things I Hate - Being weak and vulnerable. Things I love - Going in the right direction with my life. Nice run! Great to see you after. I wonder how much the illness affected you-- you seemed to have it all there yesterday.